Added on September 15, 2011 by ROSEGALLERY. Returning to work after a summer break is always tough. There's the mound of post to wade through and an inbox crammed with thousands of emails to check but when I arrived back in the office a couple of weeks ago I had a treat in store, as on my desk was a new book, Subway by Bruce Davidson. Now, many among you are probably saying it's not a new book at all but a re-print of an old one, and indeed it is, or to be more accurate an updated version of one first published in 1986. 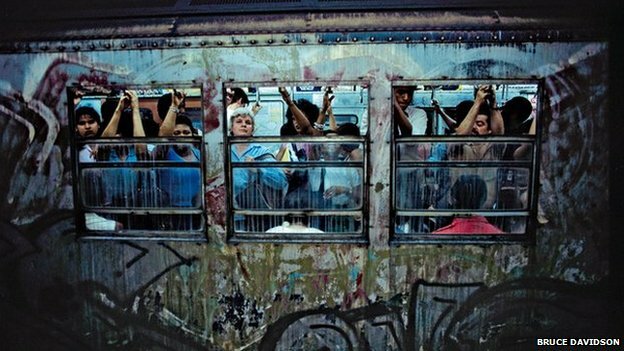 The book comprises more than 100 pictures taken by Davidson while riding the subway in New York in the first half of the 80s, a time when it was notorious for crime and some wild graffiti. Initially he worked in black and white but thankfully soon switched to colour and the result is spellbinding. Grey caverns lit up by splashes of colour, spaces populated by startled passengers and always a feeling of unease. Some of those captured are smiling for the camera, others are caught off guard, and some carry the expression you only see on public transport - a vacant stare as eye contact is avoided and they dream of a happier place. Though Davidson's photographs can't record the sounds, heat and smell of the place, they somehow allow you to feel the intensity of the space. It is as though you can hear the squeal of metal on metal. The front of the book contains an essay by Bruce, fascinating it is too. He notes the practical aspects of the project, including his hard work to get fit before entering the underground maze to ensure he could cope with the daily pressures, through to anecdotes of his encounters. Each day he'd pack his cameras, film, flash, notebooks and most importantly a book containing pictures he'd already shot, something he could show to potential subjects. He was aware of the dangers of working in such an enclosed space and writes: "Passengers on the platform looked at me, with my expensive camera around my neck, in a way that made me feel like a tourist or deranged person." 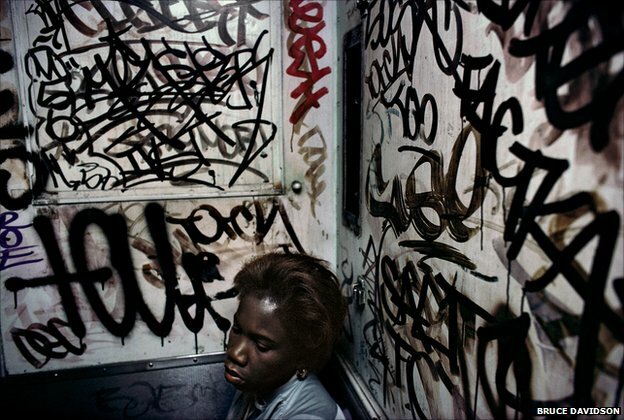 Bruce Davidson: "The subway interior was defaced with a secret handwriting that covered the walls, windows and maps. I began to imagine the signatures surrounding the passengers were ancient hieroglyphics." He had a number of ways to approach a subject, but the key point was that he had to act on impulse and not linger, as that created a barrier that was hard to overcome. Working with a large flash, there was no hiding what he was doing and so in some cases he would seek permission, and in others hope that the subject would react favourably if he shot first. He also made a point to send a print to as many of those he photographed he could. The pictures are now more than 25 years old and capture a unique time and place, yet the project is one that all students of documentary work should study deeply. The underground network provided a tight framework and acts as a stage upon which he could cast the players to fill his world. It's good honest photography, no tricks, just hard work, all captured by one of the great photographers of the 20th Century. 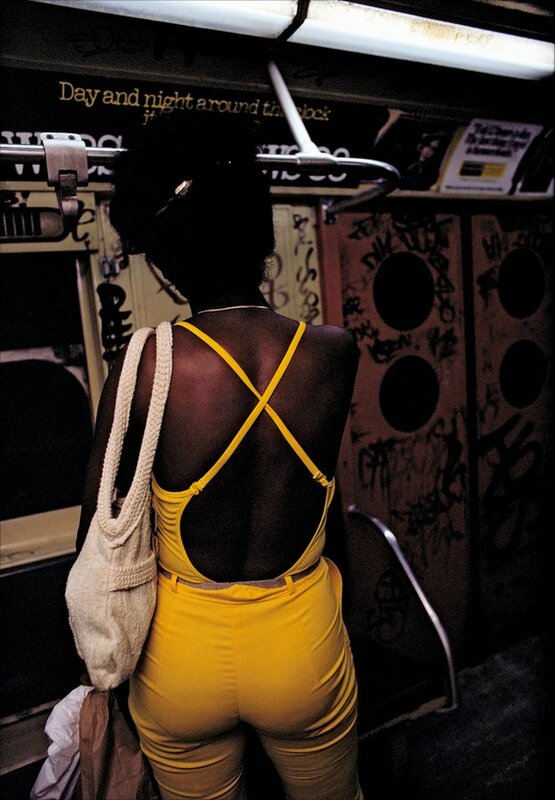 Subway by Bruce Davidson is published by Steidl. 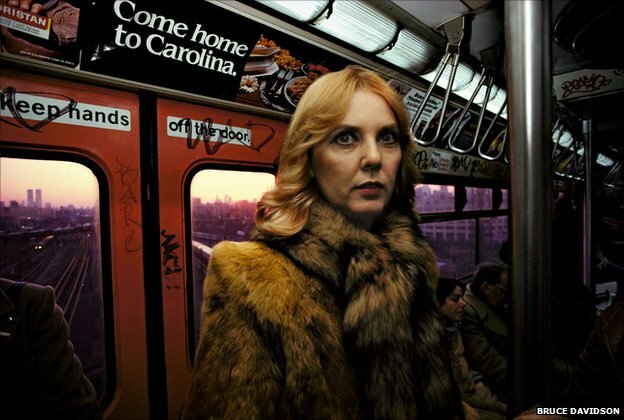 You can see more of his work on the Magnum Photos website, his book of pictures of East 100th Street being another work worth a detailed look. Guardian Angels first made an appearance on the New York subway in 1979 in an attempt to quell rising levels of violence.